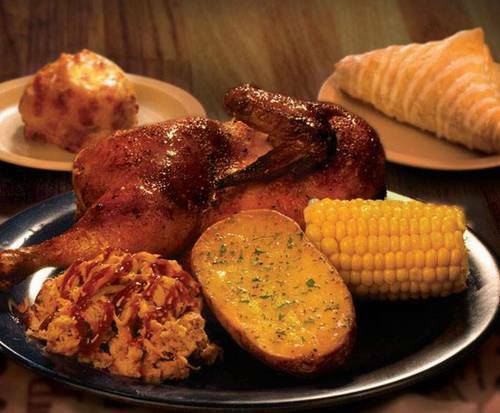 Dubbed The Most Fun Place to Eat, Pirates Voyage brings to life the spirits of the pirates and buccaneers that once sailed the coast of the Carolinas! Join Captain Blackbeard, his Quartermaster Calico Jack, and the Crimson and Sapphire crews as an epic battle for the coveted Davey Jones sunken treasure with Pirates Voyage Myrtle Beach SC. With sword fighting, cannons blazing, and all-new aerial and acrobatic acts, you are in for an action-packed adventure you will remember for a lifetime when you purchase tickets. Experience the swashbuckling attraction and take sides between the two pirate crews as they battle on land, on deck, in water and high above the full-sized pirate ships in a 15-foot deep indoor hideaway lagoon. The action just might take your breath away as you thrill to spectacular acrobatic competitions, sea lions, tropical birds, beautiful mermaids and much more. 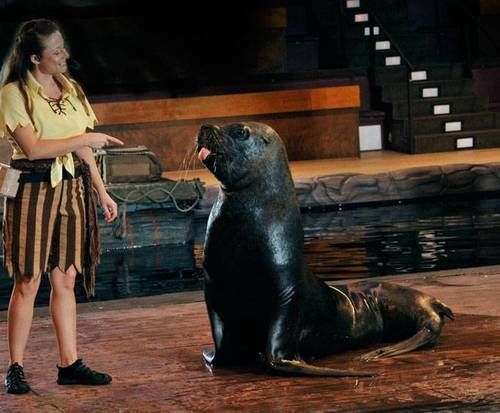 One of the most captivating features of Pirates Voyage Dinner & Show in Myrtle Beach, SC is the use of live animals in their shows as well as the extensive theatrics and special effects. All of these elements come together to create a truly immersive adventure that will captivate the senses of all who watch. The show is packed full of adventure, competition, audience participation and romance set to musical scores by Dolly Parton. A favorite among many a TripAdvisor traveler, this show truly has something for everyone. An all-new beautiful and expressive aerial act between Captain DeBlue and Captain Scarlett of the Sapphire and Crimson crews will hypnotize you with romance. Excitement also builds with another new acrobatic act, in which the crews climb, slide down and pose on the ships’ masts. Their skill and bravery will keep you on the edge of your seat. The adventure comes to a bold finish, complete with nets full of treasure, gold coins, fountains of water and thrilling pyrotechnics. As the adventure unfolds, you will enjoy a four-course pirate feast that is sure to leave you totally satisfied. The crew serves up Voyager Creamy Vegetable Soup, Buccaneer Bread, Half O’Roasted Cackler (chicken), Cob-O’ Buttery Corn, Pirate Herb-basted Potato wedge, Apple O’ Me Eye Pie and soft drinks, tea or coffee. Luckily for the herbivorous pirates, there are vegetarian and gluten-free meals available upon request (mention at the time of reservation). Arrive early to experience the interactive Pirates Village, where guests learn the pirate way. At the Pirates Village, seafarers of all ages are sure to have an amazing time mixing and mingling among the conquerors. It is suggested that guests arrive approximately one hour early to ensure that they arrive in enough time to enjoy all of the fun at Pirates Village. The kiddos can dress up as pirates or even a mermaid complete with hats and eye patches and even get their faces painted (additional cost) for extra fun. Plus, there will be pirate-themed activities such as a sea-song sing-along, balancing acts, juggling, and tons of audience participation for a truly immersive experience. Guests will be able to purchase and enjoy pirate-themed beverages as well as yummy snacks fit for a sailor! Follow your map and find your very own ‘X marks the spot’ at the Pirates Treasure Gift Shop! Here, it’s easy to bring a little piece of your Pirate's Voyage home with you. From ceramic mermaids, toys, t-shirts, pirate hats, toy swords, and more, you can bring some of the fun back to your land-bound friends or grab something for yourself to remember your adventure! During November and December, guests can visit Pirate’s Voyage to enjoy a holiday-themed adventure. This Christmas show makes for a unique experience. Follow Captain Scrooge along with the Mystical Christmas Spirit as he journeys along to discover the true meaning of the holidays. Guests of all ages will be delighted to watch talented acrobats dressed as Christmas toys attempt amazing feats above the sparkling pool. There will also be a beautiful, live nativity scene featuring live animals such as such as camels, as well as the message of Christmas. The entire family will also be awestruck as they witness the Crimson and Emerald pirates as they battle for claim over the Christmas treasure. With two full-sized ships, special effects, captivating story, and more, it’s bound to be an amazing time! Enjoy this exciting venue in Myrtle Beach at the Pirates Voyage Dinner & Show—The Most Fun Place to Eat!™-- and make memories to last a lifetime. Previously the Dolly Parton's Stampede, Dolly Parton changed the Myrtle Beach theater after 18 years of shows to a pirate show. After going under extensive renovations, it was opened with brand new features that all come together to create what the show is today. This experience is unique and provides tons of fun to guests, drawing thousands of visitors each year. After Dolly Parton's Stampede shut down after the Christmas show of 2010, and only six months later at the beginning of June 2011, it reopened as Pirates Voyage Dinner & Show, a watery wonderland with an indoor lagoon where pirates roam. The show has been captivating audiences ever since. The theater itself features one of the most stunning pieces of theatrical assets - a 750,000-gallon swim pool which harbors the battle between good and evil. Another notable feature of the show includes the magnificent large-scale ships in which the pirate battles take place. As well as this, the show itself follows the story of Blackbeard, who not only is one of the most infamous pirates in all of history but who also has historical ties to the Myrtle Beach South Carolina area. So for an amazing show that also dips its toe into the history of the area, you definitely do not want to miss out. Pirates Voyage is located in the North Myrtle Beach area on the Grand Strand, so it's perfect for getting in some fantastic vacation memories. Don't forget to take to other amazing shows and attractions such as the Barefoot Landing, Carolina Opry, the Alabama Theatre, and Ripley Aquarium for an unforgettable Myrtle Beach vacation. If you and the entire family are looking for an amazing time in the beach city of Myrtle Beach, SC, do not miss out on Pirates Voyage Dinner & Show! Book your Myrtle Beach tickets today and be on your way to an unforgettable adventure! What is included in the admission price for Pirates Voyage Dinner & Show? Approximately how long is the Pirates Voyage Dinner & Show? The experience lasts approximately 2.5 hours. The theater is held at the Pirates Voyage Theater. Before the show, guests can visit Pirates Village to visit with pirates and kiddos can dress up as princesses or pirates. "This is the best show ever!" This is the best show ever! I have been to this show about 5 times and i thoroughly enjoy it each time! The food is great and the show is excellent, whether it's the regular show or the christmas show. "LOVED the show and the food! " My 7 yr old daughter loved the show and the food! She said she never wanted the night to end! Our server was excellent and had such a fun personality... Every time we go back to myrtle beach we will definitely be going back! Awesome show!!! Vacation made easy has great customer service and was available to answer any questionsuggestions i had! Easy process! "We had a grand old time!" We had a grand old time! It's our 2nd visit to the pirates voyage and brought our families with us to share the fun-filled family show. Tip: Come in hungry for the show because they will feed you royally!